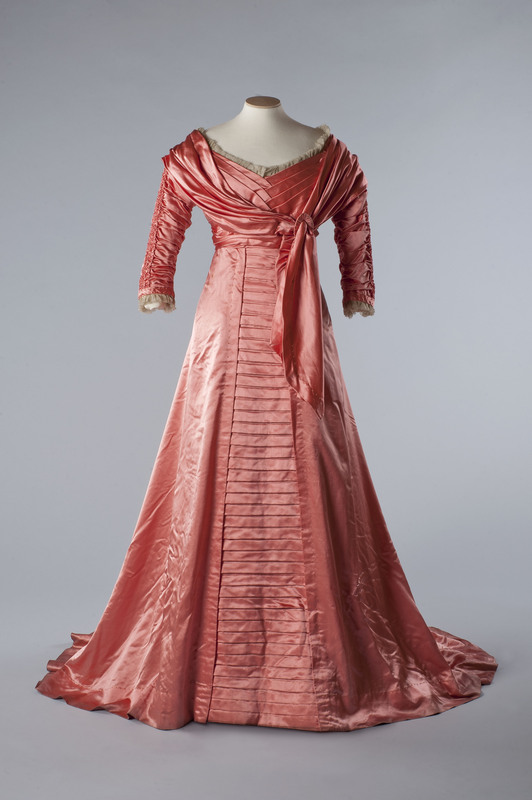 Silk satin evening gown, 1909. Image courtesy of the Olive Matthews Collection, Chertsey Museum. Photograph by John Chase. Museum’s new fashion exhibition, Farewell to All That, looks back at a golden era. On display from the Olive Matthews Collection will be garments worn in the years before the conflict, from iconic pieces of underwear, to sports clothing, daywear and dazzling evening dress. Items of particular interest are two diaphanous tea-gowns, rigidly boned corsets, a complete tennis outfit and a voluminous lady’s bathing costume. Eveningwear will include a lavish opera coat attributed to seminal designer Paul Poiret and a stunning salmon pink satin evening gown with a long, sweeping train. The exhibition has an accompanying catalogue which will be available to purchase from the Museum. Farewell to All That will be on view from 14 September 2013 to 23 August 2014.